ENGINE REPLACEMENT TO GET MOVING AGAIN! When the ‘check engine’ light comes on, many drivers automatically panic – thinking the worst. In many cases, the repairs needed are relatively minor. However, it is sometimes necessary to make major repairs to the engine, or replace it all together. This is a highly-technical, labor-intensive task that a driver should never leave to just any auto body shop. 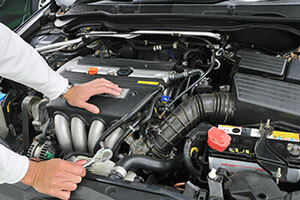 At Napa Auto Care Center, we are ASE Certified and only employ the top mechanics in the field. We can help you diagnose and repair your engine. For help with your engine problems, contact our Phoenix location today at (602) 667-3400. We also maintain a second location in the Casa Grande area, which you can reach by calling (520) 426-1500.